I'm dying to share with you the story of my shoot today in Yellowstone National Park, but more than just telling the story, I want to teach you some photographic things that I learned or noticed today. As I tell the story of the shoot, I bolded the tips that you might want to pay attention to. It was a fantastic day shooting and I encountered a lot of different situations where just a few tips could really make the difference between a boring shot and a clean photo. Nikon D7000, Nikon 600mm lens with no teleconverter, ISO 125, f/8 aperture, 1/500 shutter speed. Shooting wildlife in Yellowstone today was so much fun that I'm going to have a tough time peeling myself away from this place. I hired a terrific guide to take me to all the locations, and the Nikon 600mm f/4 lens that was loaned to me from Borrow Lenses has performed incredibly well. Yesterday, in my shoot report from day 1 of photography in Yellowstone during the winter, several people commented that they wish they could shoot wildlife but don't have the expensive lenses that it requires. Guess what! I don't have $12,000 to spend on lenses either, but I renting a lens is extremely affordable for when you're going on a trip or shooting a special event. The guide picked us up at 8AM and we headed to a location near the north entrance to Yellowstone near Gardiner, Montana where we saw the dead carcass of an animal yesterday. We saw a small wolf on the carcass, but even shooting at ISO 6,400, it was too dark to get a shot. I knew that the photo would have been unusable at that ISO on my D7000, but I was just hoping to get a “grab shot.” To remember seeing the wolf. No luck, but it was cool watching him. 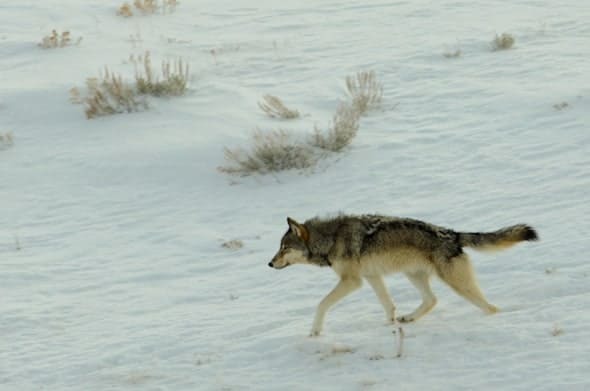 This wolf is part of the Lamar Canyon wolf pack in north Yellowstone. Nikon D7000, Nikon 600mm lens with a 1.4x teleconverter, ISO 125, 1/320 shutter speed, f/5.6 aperture. While driving through the park, our guide noticed that all of the cars were headed toward Lamar, and no cars were returning on the other side of the road. This was a tip-off to him that something incredible was ahead of us. That was a major lesson for me: Watch where other photographers stop along the road or the traffic on the road to find wildlife . There was definitely something incredible ahead of us. 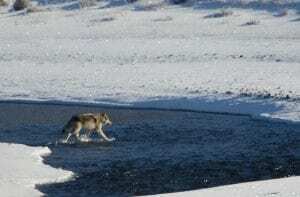 We drove right to a spot where the Lamar Canyon wolf pack was crossing the river. Right when we got there, I grabbed a close shot of a wolf, but then they scooted just barely out of camera range. 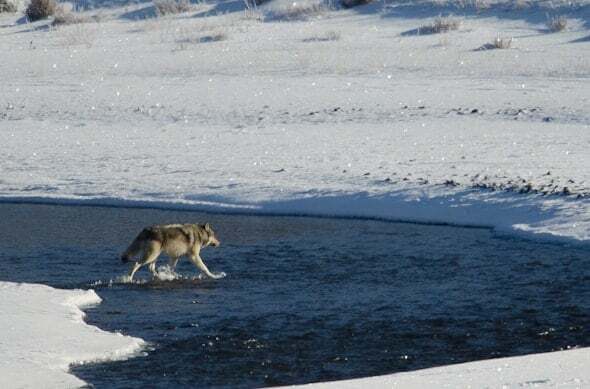 I shot a few photos as the wolves crossed the river, but it was too far to get a good action shot. When the wildlife are just a bit too far out of range, the best thing you can do is to position the animal low on the right or left of the frame and include more of the environment. This makes it seem like the animal is intentionally small, and part of the landscape. If you put the animal right in the middle of the frame, it will look like you just didn't get close enough (which, in this case, was true). If only I were a bit closer…. After shooting the wolves, we headed to a location where our guide knew there were rams. Success! We drove right to the rams and they were near the road. 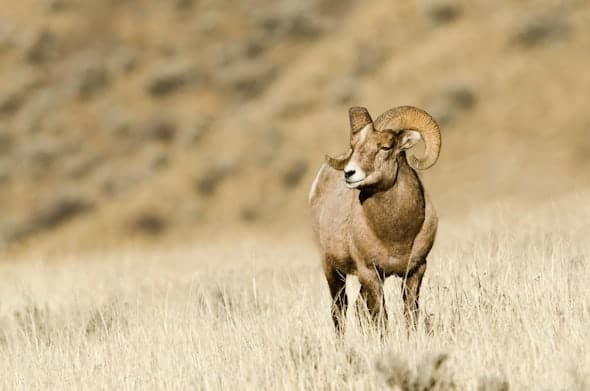 In fact, at one point I was 15 feet away from a ram when he suddenly ran toward us, so we had to get into the van. 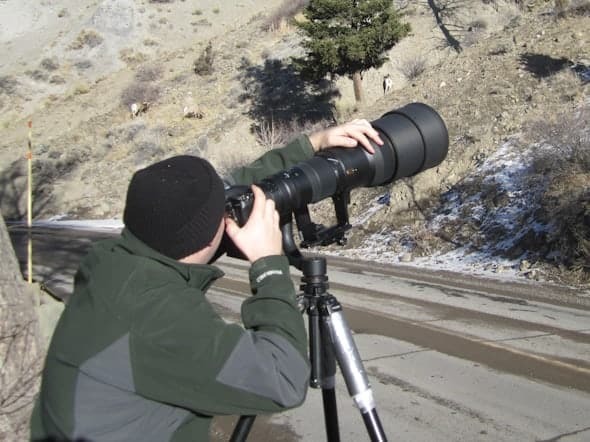 When shooting wildlife, remember to bring a shorter zoom lens along with your main long lens. 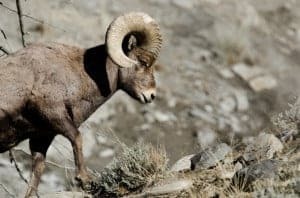 With the Nikon 600mm, the rams were WAY too close to get a shot, so switching to the shorter lens and shooting through the rolled-down window was my only option. It was while shooting the rams that I (yet again) realized just how important it is to get good light for photography. The guide positioned us so that the rams were front-lit. It was nice to get the light on the rams' face, but I quickly realized that the large, thick horns from the bighorn sheep through distracting shadows on the face of the rams. I had to wait until the rams were backlit before I could get a decent shot. Unless the light is soft or directly to your back, position the animal between you and the sun. This (mostly) backlit ram isn't in perfect light, but it's much better than the distracting “horn shadow” in the shot above. 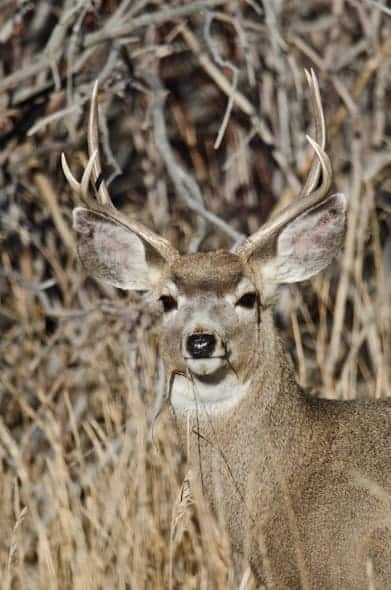 Mule deer buck in Yellowstone. Somebody should tell the idiot photographer (yes, me) to get a less distracting background so the antlers don't get hidden. As we headed back toward Gardiner, Montana and the northern stretch of the park in the afternoon to photograph more bighorn sheep, and we also happened upon a deer, tons of antelope, and a coyote. When shooting the deer, I made a huge mistake. I positioned myself so that the a bush was directly behind the deer. Since there wasn't enough space between the deer and the background, the buck's antlers are camoflauged and hidden by the twigs in the background. To get cleaner backgrounds and make the wildlife “pop”, position yourself so that there is enough distance between the animal and the background so that you show shallow depth-of-field. 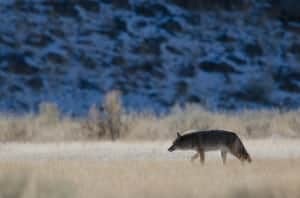 After shooting the deer, we spotted a coyote out in the field. It was a beautiful coyote in its winter coat, but it was further away than I would have liked. I used the tip that I shared above by putting the animal on the lower third of the picture so that it makes it seem less like a mistake that he is so small in the shot. After shooting the coyote, we found a good group of bighorn sheep. 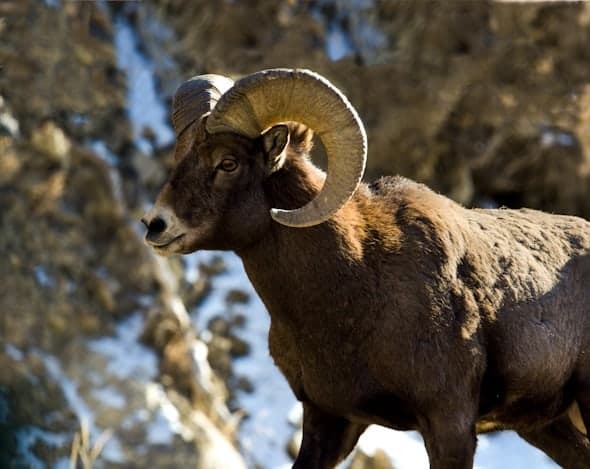 The dominant male ram in the herd was the largest bighorn sheep I have ever seen. When I first arrived at the location, the ram was far away and other rams were closer to our position. I knew I wanted a shot of that giant ram, so we waited for nearly half an hour, hoping he would approach. Eventually, he headed straight for us. If I wouldn't have been patient, I would have entirely missed the photo below. 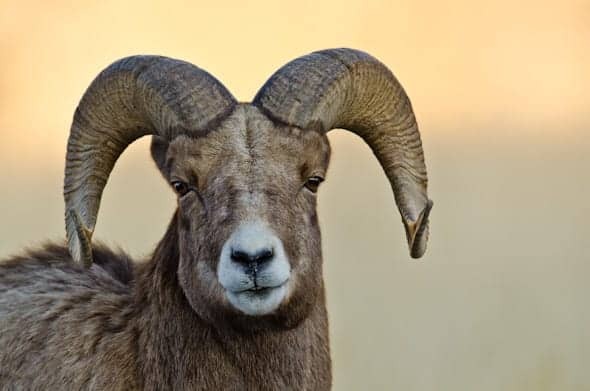 Close-up shot of a ram, with the sunset in the background. Nikon D7000, Nikon 600mm lens with no teleconverter, uncropped, f/8 aperture , 1/320 shutter speed, ISO 320. 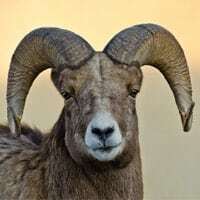 In fact, the ram got so close that the head shot above was the last shot I could make before he was too close to the car to get a shot. We stayed in the vehicle and waited for him to cross in front of the car, and drove on. It has been a terrific day, and I can't wait to wake up in the morning and enjoy Yellowstone. Seeing so many beautiful things makes me wonder how anyone could fail to believe in God as our creator.